A strong, polished brass back gives this 12" cabinet saw the extra rigidity for cutting perfectly straight tenons, dovetails, and other joints. It features crosscut-style teeth, 15 TPI, 3" depth of cut, and .048" kerf. Each Lynx saw is individually produced by a craftsman who ensures that you get a reliable tool that holds a sharp cutting edge, and will not fail under constant hard use. Setting and grinding of the teeth is done by hand so that proper tooth geometry is maintained for the best cutting action. 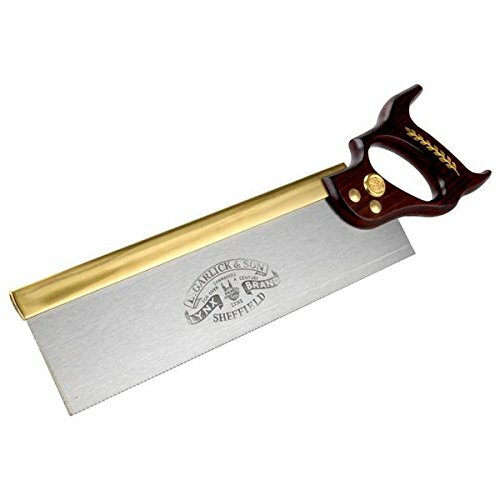 Handles are carefully crafted and fitted to blades with solid brass mounting bolts. If you have any questions about this product by Lynx, contact us by completing and submitting the form below. If you are looking for a specif part number, please include it with your message.